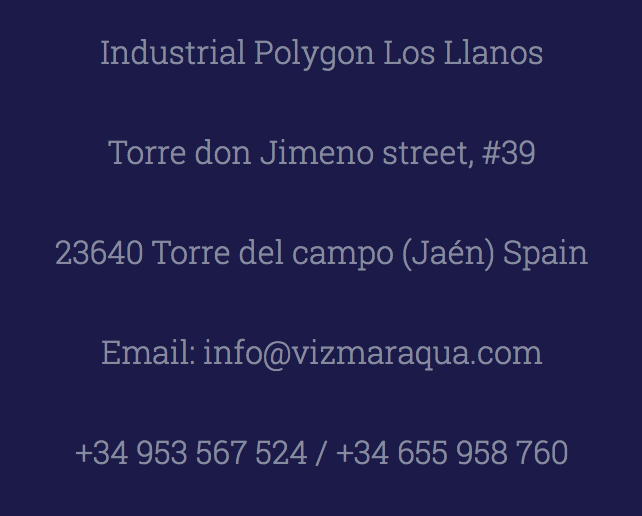 Vizmaraqua is a company dedicated to the recollection, packaging and marketing of seawater in the national and international territory. It was born with the premise of being able to divulge all the benefits that the consumption of seawater has in its different ranges. For this, the brand differentiates between three related fields, but at the same time, independent that give rise to three different brands. Aqua de Mar is the signature with which the Vizmaraqua focuses on the natural world and with which, today, has more formats. MarAqua is our signature for the culinary world. And finally, MarSport focuses on the sporting and competitive terrain at all levels, including the professional. Our extraction and first filtering facilities are located in the Cabo de Gata Natural Park (Almería). The packing plant is in the Jiennense town of Torre del campo from where we distribute our brands.